The Greater Hazleton Joint Sewer Authority (GHJSA) treatment plant and pump station construction was completed in 1967 at an approximate cost of $7,000,000. The treatment process consisted of headworks screening, primary clarification, an activated sludge biological process, secondary clarification, and liquid chlorine disinfection. In 1972, grit removal was added prior to the headworks screening. The treatment plant initially received sewage from the City of Hazleton, West Hazleton Borough, and a small portion of Hazle Township. However, after a number of years, growth in the service area, and the addition of the Lattimer Sewer Authority and portions of Sugarloaf Township contributed to the need for additional capacity. In 1987, the wastewater treatment process was enhanced by the construction of two (2) additional final clarifiers and two (2) trickling filters (bio-towers). The sludge dewatering equipment was also replaced with two state of the art belt filter presses. The total cost of the 1987 expansion project was over $5,000,000. The Authority issued bonds to fund these upgrades. In the years 1996 and 1997, older portions of the treatment plant and the remote pump stations were upgraded. Extensive concrete repairs were completed and all enclosed areas were painted. This gave the entire facility a face lift. Two (2) existing thickener tanks were overhauled and a new storage building was constructed to house vehicles and equipment. The 1996-1997 projects had a combined total over $500,000. The 2000 WWTP Upgrade was completed in 2002 with the addition of a third gravity thickener, a Magnesium Hydroxide dosing system for pH control in the aeration tanks, and an upgrade of the headworks screens. The 2000 WWTP Upgrade had a total cost of over $940,000 and was funded through a bank line of credit. In November 2009, construction began on the 2008 WWTP Upgrade, which was an extensive upgrade to the Greater Hazleton Joint Sewer Authority treatment plant and its four (4) remote pumping stations located throughout the service area. The primary purpose of the 2008 WWTP Upgrade was to comply with new state regulations for the discharge of Nitrogen and Phosphorus in the treatment plant effluent. These regulations were mandated by the state Department of Environmental Protection (DEP) as part of the Chesapeake Bay Initiative through new limits in the Authority’s discharge permit. The permit allows treated wastewater to be discharged into the state waterways; specifically, Black Creek. In order to meet compliance, the GHJSA added an entirely new treatment process onto the existing plant. The process is known as a Biological Aerated Filter (BAF) and can achieve levels well below the Authority’s permit limits. The project was substantially completed in December 2011, after nearly two years of construction. Following startup and initial troubleshooting of the new process and controls, the BAF became fully operational in mid-2012. In addition to the BAF installation for Nitrogen and Phosphorus removal, other renovations were undertaken as part of the overall 2008 WWTP Upgrade Project. Since the original treatment plant and pumping stations were constructed and placed in service in the mid-1960’s, many of the mechanical and electrical components had not been changed since the original plant was built and were in need of replacement. This upgrade included a complete electrical service replacement, installation of a SCADA system, numerous pump replacements, two (2) primary clarifier mechanism replacements, replacement of two (2) final clarifier mechanisms, the addition of several new processes including a larger sludge holding tank, a new hauled waste receiving facility and equipment, and new odor control equipment. The treatment plant bypass also underwent an upgrade to screen and disinfect wet weather overflows at the treatment plant for permit compliance during Combined Sewer Overflows (CSO). 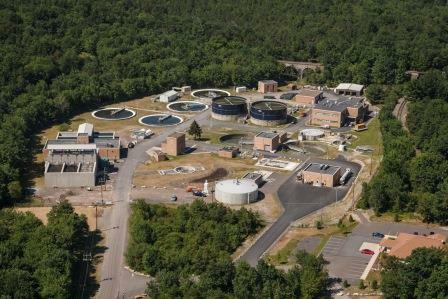 To fund the 2008 WWTP Upgrade, with a total cost of over $40,000,000, the Authority applied for and received a $33,600,000 loan from the Pennsylvania Infrastructure Investment Authority (PENNVEST). With the addition of the new loan payments, the Authority has annual debt service payments of over $3,300,000 until the year 2032. Other upgrades and additions to the treatment plant are expected over the next 5-year period including installation of a 15 dry ton per day fluidized bed incinerator for disposal of sewage sludge, installation of a headworks screen prior to grit removal, installation of a sludge cake pump and conveyors, completion of dewatering department upgrades including installation of a third Rotary Press. The planned upgrades will be funded through a combination of $7,000,000 in State grant monies awarded under the H2O Grant Program and the remaining bond proceeds.